Writing effective pay-per-click ad copy should be simple enough – the more consumers who click on your ads the better, right? Not exactly. While click-thru rate (CTR) is a good measure of how enticing your ads are, it only tells part of the story when it comes to ad effectiveness. Conversion rate is just as important of a factor when it comes to writing and optimizing ad copy. While CTR and conversion rate may not initially seem correlated, they often are – and not in the way you might think. 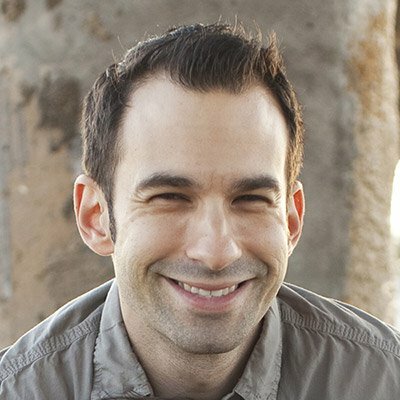 Quite often, CTR and conversion rate can have an inverse relationship. Ads with the highest CTR can have the lowest conversion rates, and vice versa. The visualization above highlights ads in the top 20th percentile of conversion and CTR. The ads with the highest conversion rate do not, for the most part, have the highest click-thru rate. 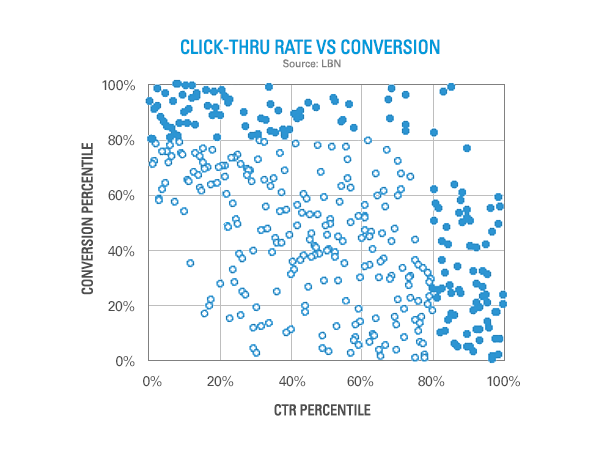 Additionally, there are very few ads in the top percentile of both conversion and CTR. This correlation can sometimes be a function of cause and effect as it pertains to ad writing. Ad copy geared solely toward enticing consumers to click on an ad that doesn’t fit a searcher’s expectations of what they will see on the landing page will result in lower conversion percentages. Conversely, ads that speak mostly to a certain niche of consumers may have higher conversion rates, but likely will not get a high volume of click or conversions. This is common to see with copy centered around offers and discounts. If an ad is written in such a way that the offer seems great until consumers read the fine print on the landing page, most visitors will not convert into customers. However, if all the caveats and exclusions of the offer are spelled out in the copy, the ad may have a higher conversion percentage but limit the number of consumers who click through to the landing page. The most important takeaway is that the best-performing ads typically don’t have the highest CTR or the highest conversion rate. Rather, they are somewhere in the middle of the pack for both metrics. They are appealing enough that searchers want to click on the ads without being misleading or too generic. The focus of optimizing ad text should be on maximizing overall profit margin. Creating relevant ad copy that garners qualified clicks is a long game. We as marketers often get too hung up on one metric or the other when refining ad copy, but the key is to keep profitability in focus. And testing, lots and lots of testing.